September 19, 2009  Mamma mia! Two former members of the Swedish pop group, ABBA, are bringing another performance to Broadway. Songwriters Benny Andersson and Bjorn Ulvaeus are adapting their Swedish musical, Kristina, for two performances next week at New York's Carnegie Hall. Andersson and Ulvaeus tell host Scott Simon why they wanted to translate the production into English and how they separate themselves from ABBA fame. 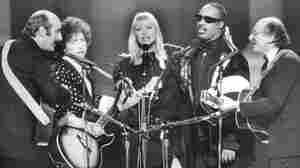 September 17, 2009  Singer Mary Travers of Peter, Paul and Mary became a singer at a time when there was no shortage of things to sing about. Raised on folk music, she helped provide a soundtrack to the times that catapulted the group from coffeehouses to the Billboard charts. Travers died Wednesday at age 72 after a battle with leukemia. September 15, 2009  Brazilian composer Jarbas Agnelli saw a photo in a newspaper of birds sitting on five parallel wires, and was inspired to treat their positions as avian sheet music. He interpreted what he saw as music and orchestrated the tune. September 10, 2009  Mongolia is better known for its ancient "throat" singing, practiced by the shamans in the time of Ghengis Khan. But in a country where almost 60 percent of the population is younger than 30, hip-hop has become an effective way of making political statements and carving out a new Mongolian identity. September 9, 2009  The new video game "The Beatles: Rock Band" goes on sale Wednesday. It tells the story of the band's rise to fame and eventual break up in 1970. While the Beatles are the most iconic group to have an entire high profile video game dedicated to them, they are not the first to realize that being on a video game is a way to attract younger fans. Mono Or Stereo: Which Beatles Box Is Better? September 8, 2009  On Sept. 9, Apple and EMI will release all of The Beatles' albums, newly remastered and sounding better than ever. There will be two box sets; a limited-edition mono box set will contain everything from 1963's Please Please Me through The White Album (The Beatles), the last Beatles record mixed in mono. It'll also include a CD full of mono mixes of the band's singles. 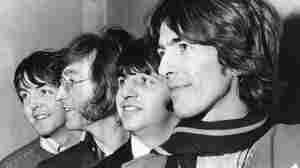 September 8, 2009  Diehard fans of The Beatles have been waiting for this moment for decades. On Sept. 9, EMI will release remastered copies of the band's entire catalog, from 1963's Please Please Me to the 1969 album Abbey Road. The remastered versions offer stunning clarity to The Beatles' music, allowing fans to hear elements in the songs they most likely never noticed before, like subtle sound effects or guitar lines that were lost in the original, all-analog releases. September 6, 2009  A modern composition technique championed by 20th century composers may have been presaged two centuries earlier by Johann Sebastian Bach. Host Liane Hansen speaks with Eric Altschuler, who writes in the current issue of Musical Times about discovering a 12-tone row in a Bach prelude. September 4, 2009  The body of Michael Jackson has been laid to rest in a mausoleum at Forest Lawn cemetery in Glendale, Calif. The late pop superstar was mourned by family and friends at a private funeral service. However, hundreds of Jackson fans gathered nearby. 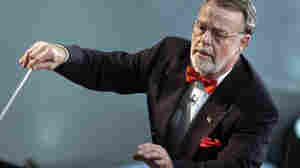 September 2, 2009  Award-winning conductor Erich Kunzel has died at the age of 74. He had been diagnosed with liver, colon and pancreatic cancer in April. Kunzel headed the Cincinnati Pops Orchestra since it was founded three decades ago. He had led the National Symphony on the Capitol lawn in nationally televised Memorial Day and Independence Day concerts since 1991. Janelle Gelfand, music critic for The Enquirer in Cincinnati talks with Renee Montagne about Kunzel's work. September 1, 2009  The legendary pop singer makes a highly anticipated comeback this week with the release of her new album, I Look To You. 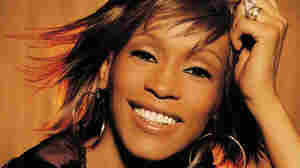 The Grammy-winning artist returns from a lengthy hiatus, marked by rumors of drug abuse and a troubled marriage. September 1, 2009  Once dubbed "The Prince of Pops," Kunzel, who died Tuesday, continued in a long line of famous pops conductors such as Arthur Fiedler. Hear the exuberant Kunzel lead his beloved Cincinnati Pops Orchestra in music by Strauss and Copland.